This highly conceptual picture book offers “a visual poem about China.” Opening the book (from the bottom rather than the side), the reader sees a strip of each page, since each is about one-half inch longer than the preceding one. The entire poem is visible immediately, with one line per page. Besides the line of verse, a typical page includes one or two ancient Chinese characters in red, with the English equivalent in black. Observers will note the resonance between the forms of the Chinese characters and the images in the illustrations, bold collages of cut and torn papers. The final end papers offer a chart of ancient and modern Chinese characters. As Mother Goose has known for centuries, rhyme and rhythm are fun! And what could be a more enjoyable way for children and their parents to learn about different cultures and languages than through familiar rhymes and songs? In Chinese and English Nursery Rhymes, an innovative collection of favorite rhymes are put in pairs—one from China and the next in English—to show how the things that kids love are the same, no matter where in the world they live. 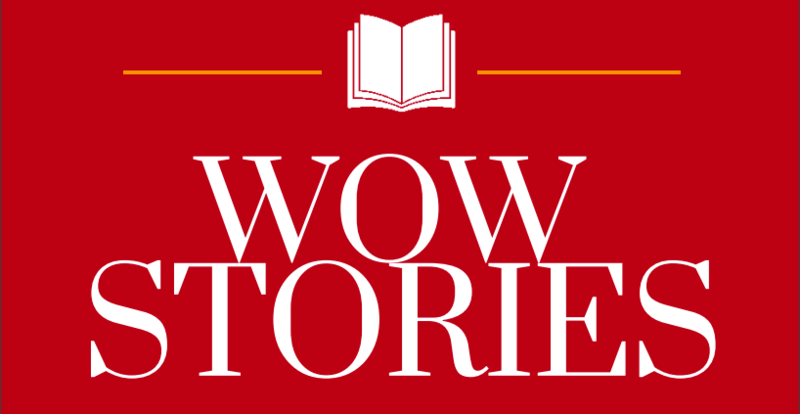 Chinese Mythology seeks to enchant readers young and old as both an author and a publisher. An avid traveler, she brings her rich experience of the world into each book she writes. Chen has been creating beautiful, entertaining, and deeply moving picture books over the past twelve years. To depict the old culture of ancient China, he has relied upon myth and legend in many of his books. Everyday Life: Through Chinese Peasant Art. Morrisey, Tricia (2009). Global Directions/Things Asian Press. ISBN: 9781934159187. Everyday Life introduces children to the vibrant world created by Shanghai’s Jinshan artists. From a watermelon harvest to an autumn festival to a child’s winter game, vivid, friendly peasant art brings everyday life in rural China into our lives. Simple, rhythmic poems, presented in English, Simplified Chinese, and Pinyin, beautifully accent each painting. Everyday Life’s colorful, bustling illustrations will capture a child’s imagination, while descriptive bilingual text invites English and Chinese readers to enjoy the sweetness of each page. Eyewitness China. Sebag-Montefiore , Poppy (2007) . London; New York: DK , ISBN: 9780756629755. 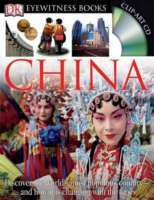 Eyewitness China, which includes a fully illustrated pull-out wall chart and CD with additional images, investigates China’s present-day culture and highlights everything from life in a rural village to changing fashions and technological innovations. 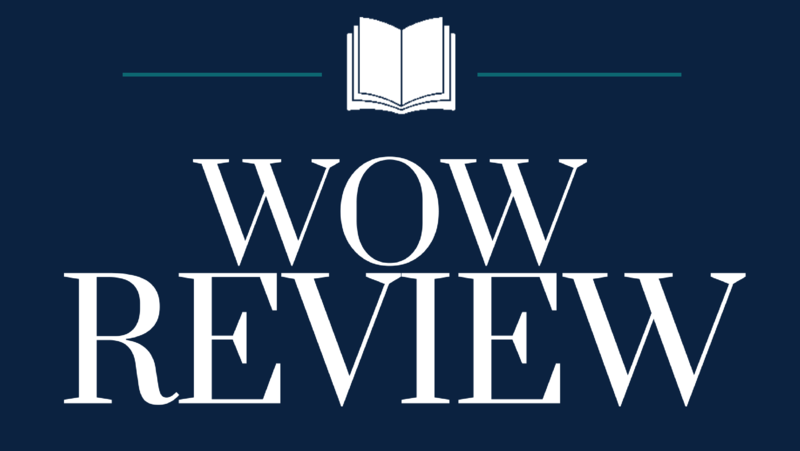 With hundreds of real-life photographs, discover the secrets of traditional Chinese medicine, find out how China is surging ahead in international sports, trace each dynasty with the help of a comprehensive timeline, and much, much more! Good Morning China. Yi, Hu Yong (2007). New Milford, CT.: Roaring Brook Press. ISBN: 9781596432406. Enhanced with a foldout and animated illustrations, a day-in-the-life of a community in China is captured in this beautiful presentation of its people, places, and special happenings. Pictures and easy-to-read text portray the activities and routines of Chinese people on a typical morning in the park, with a fold-out page showing everyone in the park. He started learning to play the piano when he was three years old in Shenyang, China. Today he is one of the world’s most outstanding pianists. In this engrossing life story, adapted by Michael French, Lang Lang not only recounts the difficult, often thrilling, events of his early days, but also shares his perspective on his rapidly changing homeland. He thoughtfully explores the differences between East and West, especially in the realm of classical music and cultural life. Shining through his rags-to-riches story of a child prodigy who came of age as a renowned musician. Legend of the Chinese Dragon (English and Mandarin Chinese Edition). Sellier, Marie (2008). New York: NorthSouth Books. ISBN: 9780735821521. In ancient China, the different tribes lived under the protection of benevolent spirits that took the form of animals–fish, ox, bird, horse, and serpent. But, as often happens, the tribes grew envious of each other and began to fight amongst themselves in the names of their spirits. The children decided to declare a war on war by creating a creature that combined the best of all the spirits and would protect all the people. To this day, the dragon is a symbol of peace and plays an especially important role in the celebration of the Chinese New Year. Little Leap Forward: A Boy in Living in Beijing. Yue, Guo (2008). Cambridge, MA: Barefoot Books. ISBN: 9781846861147. Little Leap Forward: A Boy in Living in Beijing with their large, loving families, Little Leap Forward and Little-Little are the best of friends. One day clever Little-Little captures a small yellow bird that he gives to Little Leap Forward. Though Little Leap Forward plays his flute and tries to get Little Cloud to sing, she remains silent. When the terrible disruptions of the Cultural Revolution begin, Little Leap Forward senses the fear and sadness of his friends and family. And as their lives become more and more constricted, he begins to understand why he must release his precious bird if he wants to hear her sing. Life is fascinating to children who come to this world with fresh eyes, curious minds and a strong passion to explore, especially to Wen, a little girl who grew up in China. China is a large country with a long history, a lot of traditional values and countless social rules. How did Wen make room for herself to grow in a society where girls inquisitive nature was suppressed and lively personalities were shaped to confine to the rigid social expectations? Read the story, which is based on the author s early childhood memories. Liu and the Bird: A Journey in Chinese Calligraphy. Louis, Catherine. (2006). New York: North-South Books. ISBN: 9780735820500. One night as Liu sleeps, she hears the voice of her grandfather in her dreams. Inspired to visit him, she sets out on a journey across fields and mountains, facing harsh conditions and not always knowing the way. She finds her grandfather waiting for her, and he urges her to tell the story of her travels, making an interesting connection that makes you feel like perhaps you’ve actually just read Liu’s story as recorded by her own hands. Lon Po Po: A Red-Riding Hood Story from China. Young, Ed. (1989). New York: Philomel Books. ISBN: 0399216197. Three little girls spare no mercy to Lon Po Po, the granny wolf, in this version of Little Red Riding Hood where they tempt her up a tree and over a limb, to her death. The girls’ frightened eyes are juxtaposed against Lon Po Po’s menacing squint and whirling blue costume in one of the books numerous three-picture sequences, which resemble the decorative panels of Chinese tradition. Through mixing abstract and realistic images with complex use of color and shadow, artist and translator Young has transformed a simple fairy tail into a remarkable work of art and earned the 1990 Caldecott Medal in doing so. Well-known-painter Hong introduces Han Gan, a ninth-century Chinese artist, in this beautifully illustrated, picture-book fantasy. Young Han Gan, who loves to draw, grows up to gain wide recognition for his original style and for his sole subject: horses that are always tethered: “My horses are so alive they might leap right off the paper.” A warrior challenges his claim, commissioning a steed that will spring to lifew. Han Gan meets the challenge, but his magnificent creation so abhors war’s violence that it races back to the two-dimensional world of painting. Mao and Me. Chen, Jiang Hong (2008). New York : Enchanted Lion Books. ISBN: 9781592700790. When the Cultural Revolution began, the author was a three-year-old living in a northern city. Cared for by his grandparents, he and his two sisters led a quiet, orderly life. His older sister, whom he describes as a deaf mute, taught her siblings to sign and Hong to draw. One day they heard on the radio that Mao had declared a Cultural Revolution, and life began to change. The text tells a straightforward story of the years between 1966 and 1976, while the illustrations shed a strong light on these years through the eyes of one child. Maples in the Mist: Poems for Children from the Tang Dynasty. Ho, Minfong (1996). New York: Lothrop, Lee & Shepard . SBN: 068812044X. A beautiful anthology of 16 short, unrhymed poems written 1000 years ago in China. Although the poems Ho has chosen reflect timeless themes and her translations are fresh and informal, most are too introspective for a young Western audience. An attentive fourth-grader might relate to “On the Pond,” in which two boys foolishly leave a trail betraying their mischief, or “Goose,” a straightforward observation of a paddling goose, humorously illustrated. Moonbeams, Dumplings & Dragon Boats: A Treasury of Chinese Holiday Tales, Activities & Recipes. Simonds, Nina (2002). San Diego: Harcourt, Inc. ISBN: 0152019839. So, each of a quartet of holidays includes a brief background and introduces a bevy of crafts, recipes and legends. “The Story of the Kitchen God” kicks off the section on the Chinese New Year (and the reason behind serving the traditional tanggua, or candied melons); a recipe for Five-Treasure Moon Cakes stuffed with apricot preserves, pitted dates, sweet coconut and raisins helps youngsters celebrate the Mid-Autumn Moon Festival. Little Maomao s father works in faraway places and comes home just once a year, for Chinese New Year. At first Maomao barely recognizes him, but before long the family is happily making sticky rice balls, listening to firecrackers, and watching the dragon dance in the streets below. Papa gets a haircut, makes repairs to the house, and hides a lucky coin for Maomao to find. Which she does! But all too soon it is time for Papa to go away again. This poignant, vibrantly illustrated tale, which won the prestigious Feng Zikai Chinese Children s Picture Book Award in 2009, is sure to resonate with every child who misses relatives when they are away and shows how a family s love is strong enough to endure over time and distance. My Little Book of Chinese Words. Bradley, Mary Chris (2008). NorthSouth Books . ISBN: 9780735821743. This handsome picture book focuses on the visual aspect of Chinese characters. Words are introduced on the verso with the modern Chinese character and a smaller ancient character in the upper left corner of the page, so one is immediately aware of the evolution of the visual form of the word. On the right, a full-page illustration is rendered in a way that echoes the strokes of the character. For example, the picture for the character “high” shows a pagodalike building similar to the form of the calligraphy. The words are grouped so that terms such as “see,” “look at,” and “ear” follow “eye,” whose written character is part of these other related characters, indicating the relationship of the basic word to the others. School is in session! But this is no ordinary kindergarten class. Meet sixteen young giant panda cubs at the China Conservation and Research Center for the Giant Panda at the Wolong Nature Preserve. The cubs are raised together from infancy in a protected setting, where they grow strong. Under the watchful eyes of the scientists and workers, the cubs learn skills that will help prepare them to be released into the wild. Revolution Is Not a Dinner Party. Compestine, Ying Chang (2007). New York: H. Holt . ISBN: 9780805082074. This autobiographical novel chronicles four years in the life of Ling, the daughter of bourgeois parents, during China’s Cultural Revolution in the waning years of Mao Tse-tung’s government. Ling’s father is a Western-educated surgeon, and her mother is a practitioner of traditional Chinese medicine and a homemaker. Her family’s comfortable life in Wuhan slowly crumbles (her father is jailed) in the face of political unrest, but somehow Ling’s spirit survives, and she finds strength in the face of oppression and hardship. Long is a compelling reader of this riveting account. She uses a slight Chinese accent to portray the adults, but she voices Ling in an American accent, which is probably easier for young listeners to grasp. This attractive photo-essay opens with a double-page spread of Hong Kong in the early morning mist and closes with a shot of the city at sunset. 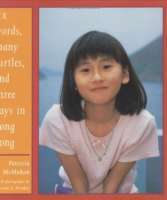 Readers are introduced to eight-year-old Tsz Yan and her family. The “six words” of the title refer to the English writing homework that the girl works on throughout the story. The “many turtles” are what she thinks school children look like with their backpacks. The “three days” are Friday, Saturday, and Sunday, thus giving readers a glimpse of the child’s life at school and at home. The colorful and exciting photos are definitely the strength of the book, and are, for the most part, logical adjuncts to the text. Unfortunately, the lack of captions may cause confusion. The Chinese Thought of It , Ye, Ting-xing (2009). Annick Press. ISBN: 9781554511952. Acupuncture, gunpowder and the secrets to spinning silk are innovations that we have come to associate with China. But did you know that the Chinese also invented the umbrella? And toilet paper, initially made from rice straw clumped together, was first used in China! Through the ages, the Chinese have used the resources available to them to improve their lives. Their development of the compass and the paddleboat helped facilitate the often difficult tasks of travel and trade, and many foods associated with health and wellness — from green tea to tofu — have their origins in China. 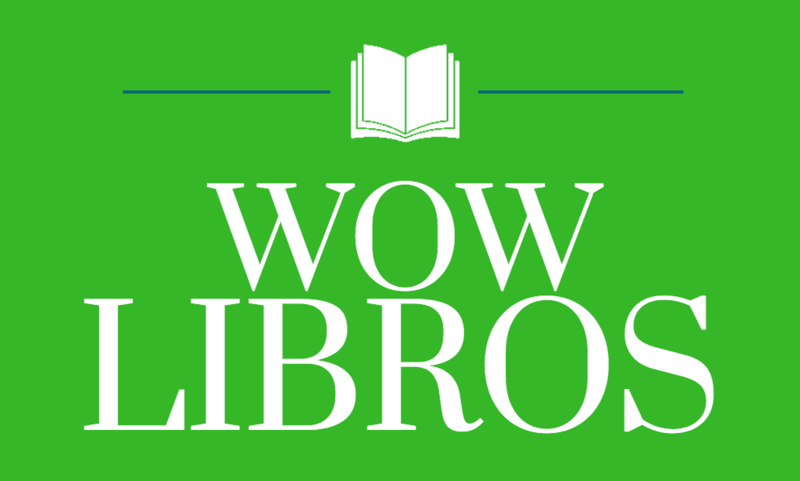 The classic story about five clever brothers, each with a different extraordinary ability is “a dramatic retelling of an old Chinese tale.” (The New York Public Library). ” . . . when Bishop makes the tall brother stretch, the sea-swallower work, or the robust one hold his breath, young children will laugh and laugh. The Magic Horse of Han Gan. Chen, Jiang Hong (2006). New York: Enchanted Lion Books. ISBN: 1592700632. Well-known-painter Hong introduces Han Gan, a ninth-century Chinese artist, in this beautifully illustrated, picture-book fantasy. Young Han Gan, who loves to draw, grows up to gain wide recognition for his original style and for his sole subject: horses that are always tethered: “My horses are so alive they might leap right off the paper.” A warrior challenges his claim, commissioning a steed that will spring to life. Han Gan meets the challenge, but his magnificent creation so abhors war’s violence that it races back to the two-dimensional world of painting. Lin, a young Chinese girl, receives a baby dragon for a gift. The two of them play together until they accidentally break a vase. Lin’s father is so angry that he insists the little creature be caged. The dragon escapes, and Lin goes to look for it. With the help of an old woman, a witch, she finds it living with the other dragons in the clouds, and grown up. The dragon returns Lin to her home, and her father agrees that they can visit often. 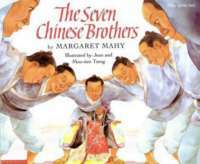 The Seven Chinese Brothers. Mahy, Margaret. (1990). New York: Scholastic Inc. ISBN: 9780590420570. The seven brothers walk, talk, and look alike, but each has his own special power. When the third brother runs afoul of the emperor and is sentenced to be beheaded, the fourth brother, who has bones of iron, takes his place. The emperor then tries drowning and burning but each time a different brother foils his scheme. 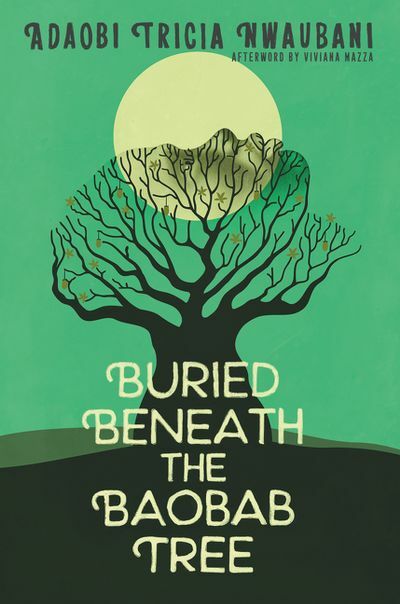 Mahy retells this traditional Chinese tale in graceful, witty prose. She uses classic storytelling elements. A long, time ago seven very special brothers were born. Each had a special power — one was immensely strong, one had powerful hearing, one was impossible to burn, one could drink an ocean in a single gulp, one could grow as tall as a mountain, one could not be cut, and one could dig through the earth faster than a mole. One day, the immensely strong brother saves the emperor from a falling boulder as the emperor and his court parades by the boy’s farm. But instead of being grateful, the evil emperor puts him in jail, jealous of his powers. The brother is to be killed the next morning. Using their special powers, the other brothers work together to save him. Time and again the angry emperor is fooled and humiliated, and in the end receives the punishment he deserves for his cruelty. 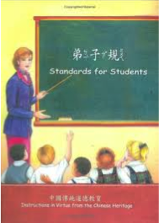 A handbook for educating students based on the ancient Confucian classics. Virtues such as filiality, have been practiced in the Orient for millennia. The other five concepts discussed are: respect for elders, carefulness, trustworthiness, kindness and friendliness to all, and drawing near to good people. Once all these virtuous qualities are instilled in children, they are ready to start studying. Therefore, this book is ideal for children, parents and teachers. Bilingual Chinese/English format (with chu yin fu hao for pronunciation). The Very Hungry Caterpillar /English/Chinese. Carle, Eric (1994). Mantra Lingua. ISBN: 9781852691264. A caterpillar eats his way through different foods until he is full and weaves a cocoon transforming into a beautiful butterfly. Charming colorful illustrations of foods along with the fat caterpillar and catchy little holes in the foods where the caterpillar “had his snack” make this book a hit with young children. Tofu Quilt. Russell, Ching Yeung (2009). New York: Lee & Low Books. ISBN: 978160060423. This collection of free-verse poems is based on Russell’s childhood and her journey to becoming an author. Yeung Ying leaves Hong Kong to spend the summer with her Uncle Five and his children in mainland China. When she recites classical Chinese poems for him, he rewards her with a special treat—a bowl of custard known as dan lai. She loves this treat so much that she vows to be a good student and become a writer. Voices of the Heart. Young, Ed (1997). New York: Scholastic Press . ISBN:0590501992. What the Rat Told Me. Louis, Catherine (2008). New York: NorthSouth Books. ISBN: 9780735822207. When the Great Emperor of Heaven invites the animals to visit him at sunrise, the rat promises to wake the cat at dawn. Instead, the rascal lets the cat sleep, rides atop the ox, and leaps off to be the first in line for the viewing, followed by the ox, the tiger, and nine other animals. The Emperor greets and assigns each creature a year in the 12-year cycle of the Chinese zodiac. When the cat discovers the rat’s ruse, their friendship dissolves, hence cats chase rats to this day. Where the Mountain Meets the Moon. Lin, Grace. (2009 ). New York: Little, Brown and Co. ISBN: 9780316114271. Living in the shadow of the Fruitless Mountain, Minli and her parents spend their days working in the rice fields, barely growing enough to feed themselves. Every night, Minli’s father tells her stories about the Jade Dragon that keeps the mountain bare, the greedy and mean Magistrate Tiger, and the Old Man of the Moon who holds everyone’s destiny. Determined to change her family’s fortune, Minli sets out to find the Old Man of the Moon, urged on by a talking goldfish who gives her clues to complete her journey. Yeh-Shen: A Cinderella Story from China. Louie, Ai-Ling. New York: Philomel Books. ISBN: 039920900X. 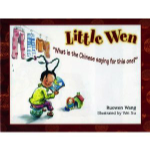 Ke Huang is from China and compiled this resource list as a doctoral student at the University of Arizona focusing on the portrayal of Chinese and Chinese-Americans in children’s literature.